In preparation for the great dragon duel in the sky over the God’s Eye Lake. Daemon Targaryen spends the last crucial days of his life, attended only by his dragon Caraxes, slashing the weirwood in the Godswood. Every cut on the heart tree marks the passing of another day. “[…] Daemon Targaryen walked the cavernous halls of Harren’s seat alone, with no companion but his dragon. Each night at dusk he slashed the heart tree in the godswood to mark the passing of another day. 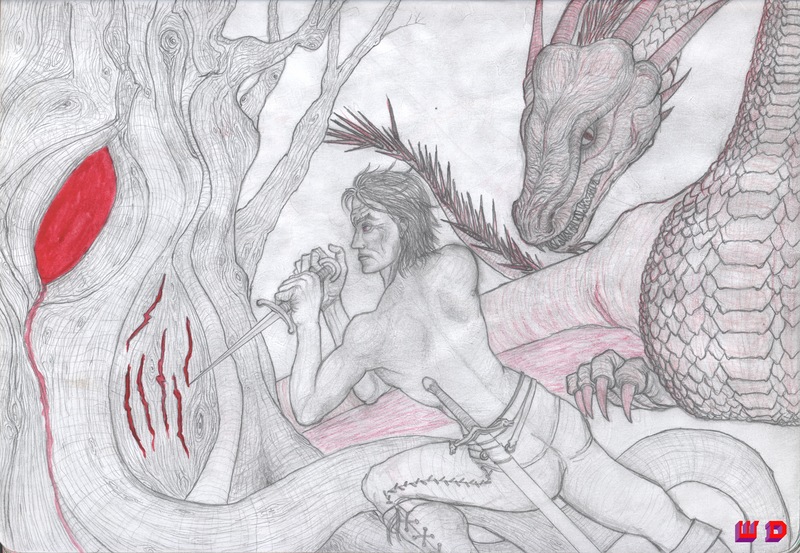 Daemon Targaryen and Caraxes. by Winter Design is licensed under a Creative Commons Attribution-NonCommercial-NoDerivatives 4.0 International License.